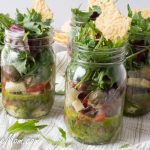 Mason jar salads have been around a while now and there are so many variations you can find. 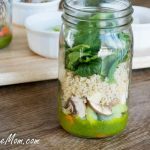 This is my first mason jar recipe for you on the blog and I’m loving how it easily stores in the fridge and lasts quite a few days. Wonderful to travel with and take on the go! 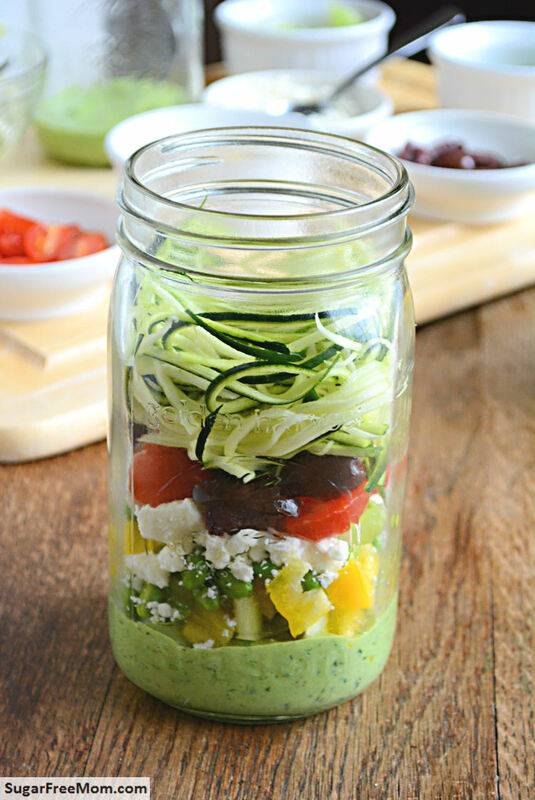 Lately zucchini noodles have been my greatest love! 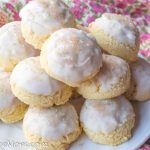 So this recipe was an easy one to create. You can change up the veggies to whatever you enjoy. 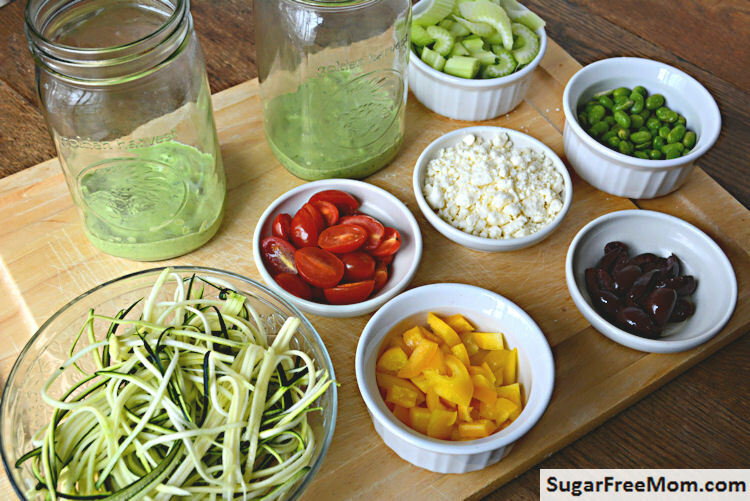 But please note how this mason jar should be assembled to make sure you don’t end up with a soggy mess of soft veggies. 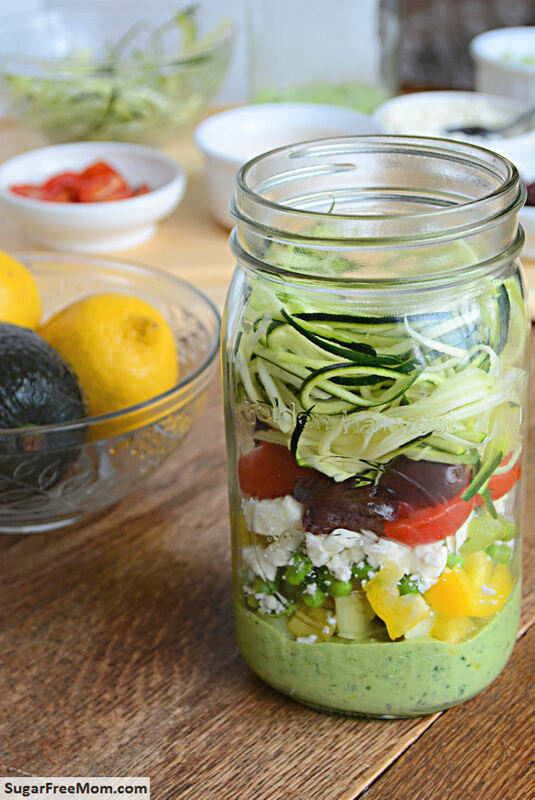 Start with your dressing at the bottom of the jar. Add hard veggies first, like celery, peppers. Next add protein and any cheese you like. Softer veggies like tomatoes go next. End with your lettuce or in this case zucchini noodles. I don’t own a spiral kitchen tool yet to make my zucchini noodles. I simply use this serrated peeler that works just as good. Your starting line up of ingredients all measured and ready to be packed! 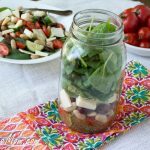 More Mason Jar Salad recipe from around the web! This pic is after 4 days of being stored covered in my refrigerator. The avocado dressing is still nice and green! You could easily substitute the raw zucchini for romaine lettuce or another lettuce you like. The optional Feta cheese and olives are not calculated in the nutrition info. The edamame can be substituted for cooked chicken breast. 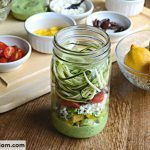 Spiral or shred or thinly slice zucchini. Set aside. In a high powdered blender mix dressing ingredients until smooth. Pour 1/2 the dressing into the bottom of 2 mason jars. Add celery on top of dressing. Add peppers on top of celery then top with edamame or chicken. Sprinkle feta cheese then add tomatoes and olives. 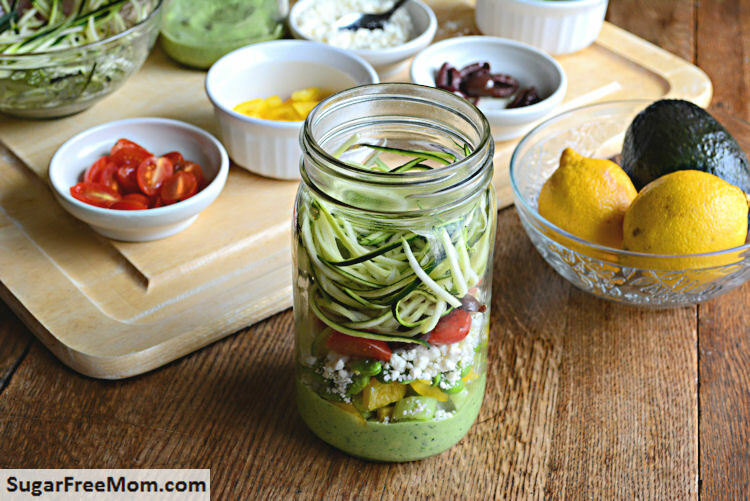 Last place 1/2 the spiraled zucchini into each mason jar. Cover and refrigerate. Last up to 5 days. 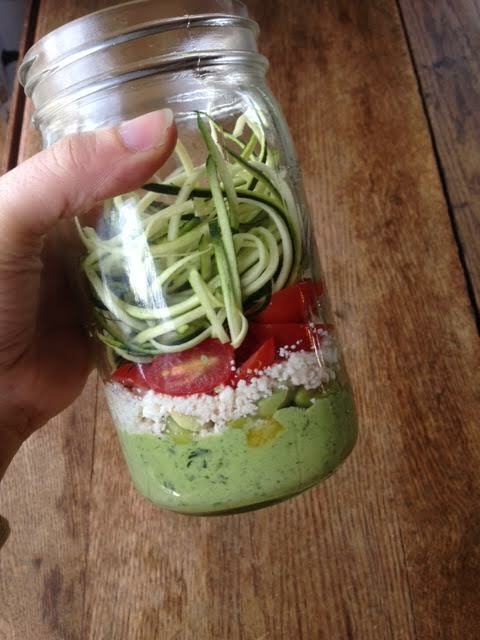 Once ready to eat, shake the jar vigorously then pour onto a plate. Toss with fork if needed to mix dressing. Love the idea and that sounds delicious. Been wanting to start doing these. Thanks a bunch. Let me know how you like it, thanks! Do you cook the zucchini.? Can it be eaten raw once it’s spiralled? It is eaten raw, no need to cook. 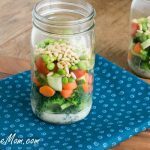 I’ve been seeing lots of mason jar salads lately and just love the idea of an easy lunch you can pull out of the refrigerator. Love the zucchini spirals! Yes I wanted something other than lettuce for a change, thank you! 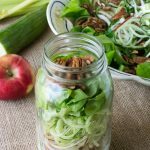 What size mason jar do you use for this recipe? I believe they are 1 quart. this is kind of a silly question, but are all the measured amounts halved? for example, would it be 1/4c cherry tomatoes in each jar? I made 2 of these to take to work for my lunch for the week. I opted out on the feta cheese (to make it a bit more healthy) and didn’t add the olives ( i don’t like olives) Its not bad, maybe the feta would have made it better. I did notice the dressing was VERY thick after sitting in the fridge. It seems like it needed something…..probably the feta (and maybe olives) or add a bit more salt to the dressing as it was a bit bland. But it is VERY filling (I only ate about 1/2-3/4 of each) And I have to say, as good as the coworkers Burger King lunch smells, I feel good that I just ate a filling healthy lunch. 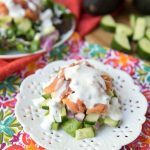 Love, love, love this salad and especially its dressing. In fact, I love it so much, it’s the Recipe of the Day on my Facebook page, “Cooking with Whole Grains & Real Whole Foods.” I don’t know why, but somehow, the photo that FB auto-included went completely away this afternoon. So bummed! If you give me permission, I’ll copy and add your photo, if FB will let me after that fact. Made this just now! I adjusted the recipe a bit to what was in my house. Dressing is delicious I added a 1/4th cup chopped red red onion (happy accident in layering when I realized I forgot olive oil) and omitted Greek yougurt (only have vanilla flavored skyr in the house.) Also omitted celery and edamame (not a fan of either).so I ended up making a Greek salad version basically. If you omitted the olive oil & Greek yogurt u only made dressing out of avocado, lemon, spinach, salt & pepper? I am going vegan & oil free.